My emphasis in teaching is on an understanding of the processes by which we gather knowledge in the natural sciences, and the way our theoretical understanding is built by combining observations and the work of other scientists. I use natural history (geology and biology) to give students a point of contact between their experience of the world and the opportunity to see fundamental natural processes at work. Through reading original scientific literature and analyzing how natural scientific arguments are made, my students build an approach to science literacy that will serve them well as broadly educated citizens. There are always opportunities for interested biology and geology students to do research at the UO Vertebrate Paleontology Lab within the department of earth sciences. Specific research questions generally relate to the roles of biotic and physical environmental forcing in driving evolution within mammals. In studying this process, we take both lineage-based and ecosystem-based approaches. Our major unifying project examines the evolution of North American fossil mammals from an ecosystem perspective: the spread of cool, dry climates through the Oligo-Miocene in North America provides an opportunity to examine the way modern mammal communities were assembled and the role environmental forcing plays in this assembly. Students in my lab have pursued projects ranging from biomechanics to paleopathology, and from paleoecology to natural history. Interested students should contact me about research openings. Professor Hopkins joined the Clark Honors College faculty in 2007 after one-year as a postdoctoral fellow at the National Evolutionary Synthesis Center at Duke University in North Carolina. In addition to her teaching, Hopkins serves as a curator for the Museum of Natural and Cultural History at the University of Oregon, sits on the executive committee for the Phi Beta Kappa honors society, Alpha of Oregon chapter, and serves on the advisory committee for the university's Science Literacy Program. Hopkins is also active in the scientific community beyond the university, serving as President of the Oregon Academy of Sciences from 2013-2014, and a member of Sigma Xi, the Society of Vertebrate Paleontology, the Geological Society of America, and the Paleontological Society. 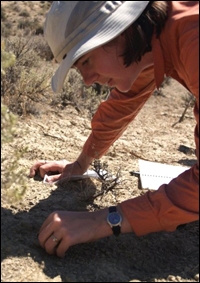 Samantha Hopkins' research explores patterns and processes of evolution of ecology in mammals, and she has an active field research program in the fossil-rich rocks of Eastern Oregon. She also has a major research project examining the evolutionary relationships among diet, body size, and natural history among living mammals. For a complete publication list see Professor Hopkins' Curriculum Vitae. 2016, "Osteopathology in Rhinocerotidae from 50 million years ago to the present" (Stilson, K.T., E.B. Davis, and S.S.B. Hopkins), PLoS One, 11(2):e0146221. 2015, "The macroevolutionary relationship between diet and body mass across mammals" (Price, S.A. and S.S.B. Hopkins), Biological Journal of the Linnean Society, 115(1): 173–184. 2013, "Oligo-Miocene climate change and mammal body-size evolution in the northwest United States: a test of Bergmann’s Rule" (Orcutt, J. and S.S.B. Hopkins), Paleobiology, 39(4): 648-661. 2012, "Tempo of trophic evolution and its impact on mammalian diversification" (Price, S.A., S.S.B. Hopkins, V.L. Roth, and K.K. Smith), Proceedings of the National Academy of Sciences, USA, 109(18): 7008-7012. 2011, "Turnover in burrowing rodents: the roles of competition and habitat change" (Calede, J. and S.S.B. Hopkins), Palaeogeography, Palaeoclimatology, Palaeoecology, 311(3): 242-255.